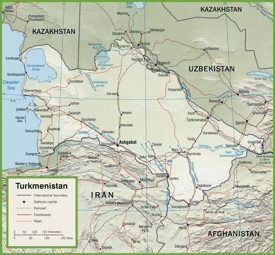 Turkmenistan is a country in Central Asia, surrounded by Afghanistan to the southeast, Kazakhstan to the northwest, Iran to the southwest, Uzbekistan to the north and east. It bordered by Caspian Sea to the west and has the following rivers in the country itself: Amu Darya, the Tejen, and the Murgab. 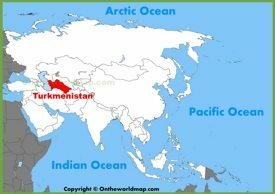 Turkmenistan used to be a part of Soviet Union till 1991 and since then it is independent. The capital city is Ashgabat. Turkmen is the official language. Many people still speak Russian. 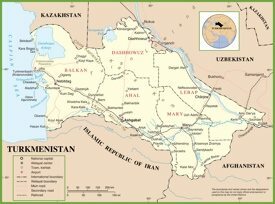 More than 80% of the country is covered by the Karakum Desert. Russian’s famous chocolate candies named after that Desert and called “Karakum”. Area: 188,456 sq mi (491,210 sq km). Largest cities: Ashgabat, Türkmenabat, Daşoguz, Mary.